Unique clip allows for one handed loading of up to 30 sheets of paper. Mount to left or right side of monitor and swings out of the way when not in use. 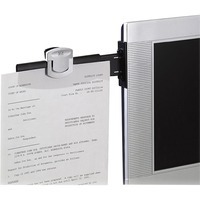 Document clip includes Command Adhesive for easy mounting and clean removal from monitor.